Incomparable Long Island Summer Camp Facilities! The Pierce Country Day Camp facility is simply the finest in the nation. Our meticulously groomed 27 acre landscape offers an inspirational, estate-like setting. Pierce includes the very best in recreational, athletic, and fine and performing arts facilities. We pride ourselves on cultivating a pristine natural environment. Clean bathrooms and water fountains are located throughout camp. Beautiful flowers, well-groomed gardens, and some of Long Island’s most majestic trees cover our magnificent campus. The centerpiece of the Pierce campground is a beautiful, century-old Italian mansion. This building houses our air-conditioned dining hall, kitchen and music rooms, plus facilities for our junior campers. The mansion also plays a major role with our school year pre-school programs. 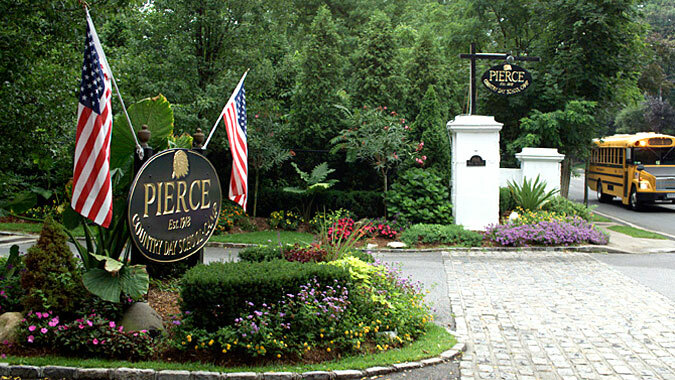 In summer 2007, we opened The Clubhouse, another Pierce exclusive! Offering 5100+ square feet of air-conditioned indoor space, The Clubhouse provides an innovative destination for creative exploration. It is also a perfect refuge on excessively hot or rainy days. The Clubhouse includes a complete commercial kitchen, professional stage & sound system, theatrical “back-stage” area, three 50-inch flat screen TVs, an 8 foot projection screen, and a professional Karaoke unit. It also houses high-tech, interactive keypad equipment for game-show type fun! The Pierce Country Day Camp grounds also include individual group cabins. These comfortable cabins give each group a home base where they can store their camp gear and change for swim. The Pierce Aquatics complex is unrivalled in all of camping. Our Aquatics facilities feature 7 beautiful pools, including The Aqua Dome, our Olympic indoor pool. These crystal clear, temperature controlled pools offer a comfortable swim setting for campers of every age and skill level. With awesome waterslides and exciting, interactive elements they also create endless opportunities for swimming FUN!!! Water World at Pierce Country Day Camp! Another Pierce exclusive is Water World, our fabulous on-site sprayground and water-park. This interactive aquatic fantasy-land is filled with colorful above-ground water play features. Water World also includes a vast array of below-ground jet sprays, geysers, and fountains with “Funflow” valves that campers direct.